If you’re looking to enroll in a graduate business program to get your MBA, then you’ll need to excel on the GMAT. The higher your score on the GMAT, the stronger your application will be. Finding free GMAT prep materials can be a lifesaver. Those who can’t afford to buy practice questions and tests can simply rely on free material present online. Even if you do have some money to spend, the more free practice questions you solve, the less you’ll need to buy those that need a subscription. While free GMAT prep materials aren’t countless, there are enough to get you at least close to your target score. The official website for GMAT is mba.com. What better source to prep for a test than through the organization behind it? 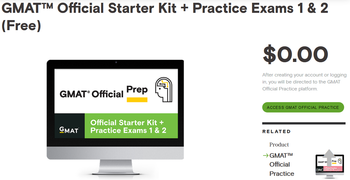 The site offers the Official GMAT Starter Kit, which includes 90 free GMAT prep questions as well as two full mock exams. All you need to do in order to access it is sign up for a free account at mba.com then download the Official GMATPrep Software. If you feel like you need more practice, then you can use the software to purchase additional questions. What’s so great about this is that since mba.com is the official website, it’s going to have all the updates along with any recent modifications to the style of questions. The best way to use the two practice tests/mock exams would be to take one at the very start in order to know your baseline level, then take the other once you’re done studying to know if you’re close to your target score. Additionally, you can take each practice test more than once. The awesome news is that they change. For Example: If you take Test A now, you can take it again in a couple of weeks and you’ll find that they’ve updated and changed most questions. So in a way, you’re getting 3-4 free practice tests not just 2. It would’ve been nice to get more than 90 free questions from MBA.com, but 90 is still a lot, plus you’ll be getting lots of practice as you retake updated tests. Manhattan Prep is another popular source for GMAT practice materials. What you’ll benefit from the most is that they provide you with a full free practice test. On completing the test, you won’t just receive a score, but also an analysis of your strength and weaknesses. Knowing your weaknesses is an essential part of studying so you can focus on and eliminate them. Manhattan Prep also offers tutorials as well as some practice questions, but these are all samples. You won’t get access to a full course, instead their purpose is for you to find the samples useful and purchase the full tutorial or course. Apart from the full practice test, these other materials aren’t too useful if you don’t plan on buying them. Take a look at them anyway, you might find one some of the sample videos to cover your weak spots. Veritas Prep is another source you can use online to get free practice questions and one full-length test. Much like Manhattan Prep, it’s also an educational site that offers courses and you’ll need to pay to access their full range of services. What makes them unique is that they have online live classes. If you feel like studying on your own is hard or if there are concepts you can’t wrap your head around, these online classes will be useful. Of course, you could just use the free questions and the practice test they offer with nothing else. Kaplan provides a free, full-length, realistic practice test for the GMAT. Upon completion, you receive a detailed score analysis, answers, and explanations for up to 18 sample questions through video instruction by expert faculty. They also offer a 20-Minute GMAT Workout, where you can try your hand at a few sample GMAT questions to see where you stand. The Princeton Review offers a full-length practice test under realistic testing conditions. Try your hand at the types of questions you’ll see on the real test and get a personalized score report highlighting your strengths and areas of improvement. A few years back, Magoosh put out its free Complete Guide to the GMAT. Although it’s a bit dated, a lot of the concepts and study advice found in this resource are timeless. There are separate sections on time management, how to analyze an argument, integrated reasoning, and quantitative reasoning. Beat The GMAT won’t provide you with free GMAT prep material because it’s basically a forum, but you’re going to want to use it anyway. Preparing for tests especially ones on such a large scale like GMAT isn’t only about study materials. It’s also about learning from the experiences of others and finding out what they studied from, their schedules, and what they wished they had done differently. Good to Know: As a forum, Beat The GMAT fulfills these criteria as hundreds and thousands of test-takers come together to discuss everything about GMAT. Apart from all the knowledge, feeling you’re part of a small community will help you keep going when things get tough. Through the discussions on the forum you could find links to additional free practice questions too! Taking the GMAT shouldn’t be a complicated matter. With the free GMAT prep sources we’ve provided you with, you have lots of material to study from and cover most aspects of the exam. Don’t look at free practice tests as just that, practice tests contain lots of questions that you can learn from too. Use these tools to your advantage and studying for the GMAT could end up being completely free. Another popular online forum for GMAT takers can be found at GMATClub.com. 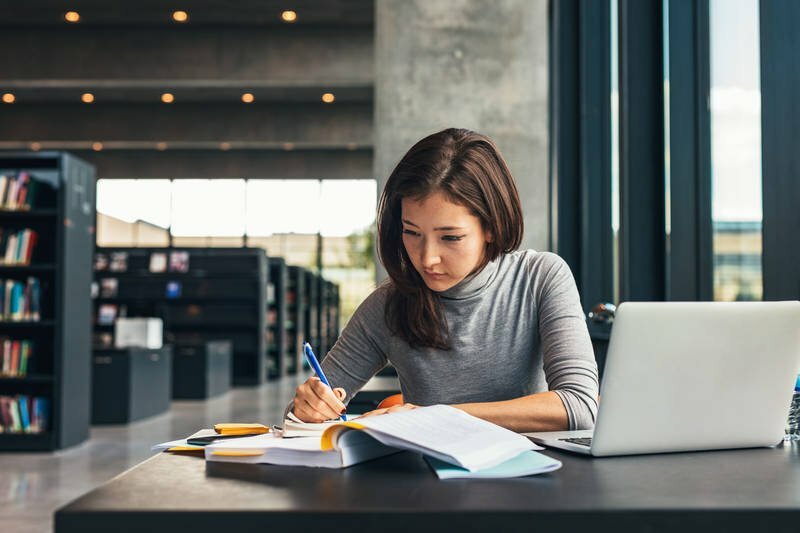 GMAT Prep Now offers a free downloadable GMAT Improvement Chart that helps you track your progress and identify weaknesses as you work through practice questions. Also from GMAT Prep Now is the 60-Day GMAT Study Guide. By signing up, you receive a daily e-mail explaining how to study for your GMAT over 60 days. These emails include specific actionable items for you to do as you prepare for the GMAT. People struggle finding free prep material for lots of tests, not just GMAT, even though libraries can be really useful. You’re going to find books that contain practice questions and study material at your local library. There are a couple of problems with relying on the library though. The first is that these books could be outdated: tests like the GMAT are regularly updated and renewed so don’t use material that’s over 2 years old. So before studying from a book at the library, check for its edition or year of publish to find out whether or not it’s recent. The second issue is that the GMAT is a test you take online via a computer, while resources at the library will be paper based. You can overcome this by using free GMAT prep materials from the library and then practicing test taking at home using MBA.com and Manhattan Prep’s free practice tests. If you’re a part of some community or club, chances are that there are others in that club who are either MBA students themselves or know a currently-enrolled MBA student. Take advantage of these connections by obtaining the student’s email address and shooting them a quick email asking for GMAT advice. Most people are happy to talk about the struggles they went through in reaching some goal, like scoring high on the GMAT and getting into an MBA program. So don’t be afraid to get advice from someone who’s “been there, done that”! Many people have an aversion to throwing away books, so they end up giving them away. 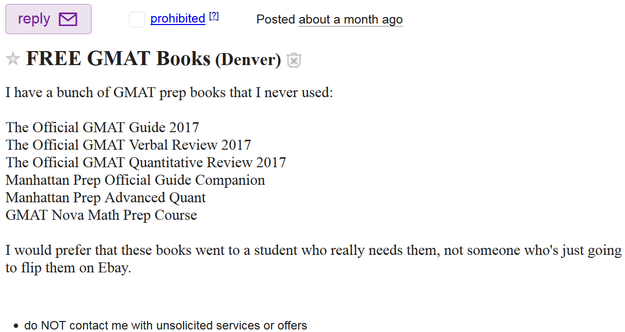 Check the “free” section of your local Craigslist and see if there is anybody on there giving away free GMAT resources at the moment. Keep in mind, however, that the resources being provided may be a year or two old. Also, as with any Craigslist transaction, we recommend that you meet the individual at a public location rather than within their home.